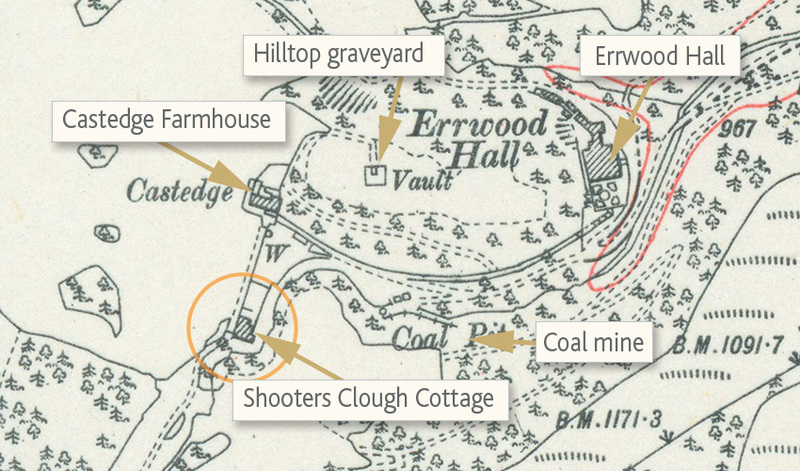 Above: This 1890 map (click to enlarge) showing the two cottages in Castedge. But now sadly gone. Above: George’s Falls. This picturesque spot, just behind the ruins of the cottage, is a wonderful place to enjoy the tranquil beauty of the Goyt Valley. Above: Kathleen Nall lived with her family at Castedge Cottage, from where this photo was taken. She’s collecting water from the spring, which can still be seen today. It lies amongst the remains of the stone wall, and opposite the sad pile of stones which was once her home. The photo above is the only one I’ve seen of Shooter’s Clough Cottage, which was once home to Jack Hewitt, the last manager of Castedge Coal Mine. The mine closed in 1933 following a flash flood a few years earlier. Click here for more details about the mine. I can’t find any census records under the name ‘Shooter’s Clough Cottage’. This was the name Gerald Hewitt used in his ‘Goyt Valley Romance’. 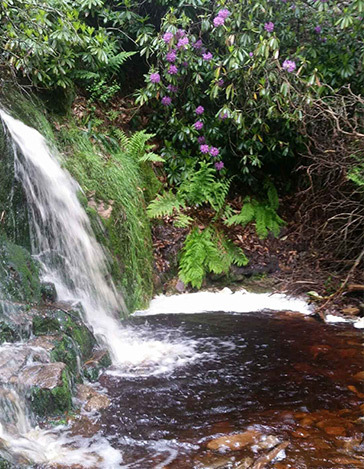 Shooter’s Clough is the stream which ran beside both the house and the mine. There’s very little left of the house today beyond a few scattered stones and some bumps in the ground. To find them, keep the the remains of the stone walls which once surrounded vegetable gardens on your left, and go through a gap in the wall a little further on your left. The census records for Castedge are confusing. In 1871 there are records for Castage and Castage Cottage. And in 1901 there are records for Castage No.1 and Castage No.2. So I’m guessing one of them must refer to Shooter’s Clough Cottage, and the other to Castedge Cottage. I’ve put all the Castedge census records on the Castedge Cottage page. I’ll update things when they become a little clearer! All we do know is that Jack Hewitt was the last tenant of Shooter’s Clough Cottage. And that he must have left sometime after the flash flood of 1930, when the damage to the mine had proved beyond economic repair.